Not many gadgets are worthy of their own book, but the iconic iPod is no ordinary gadget. 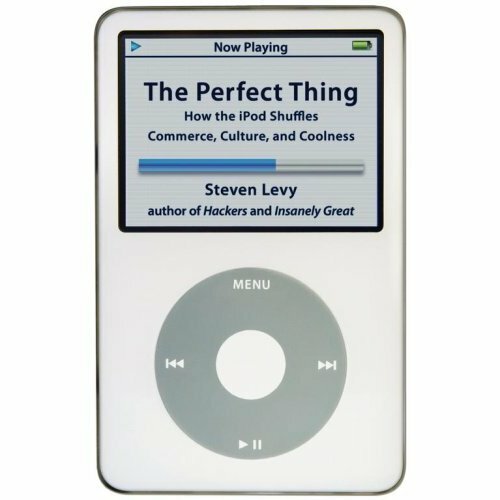 Apple didn’t make the first MP3 player, but by transforming a good idea into what author Steven Levy calls “the perfect thing,” the computer company helped foster a revolution that is creating new industries as it disrupts and remakes old ones. Levy’s history of the iPod is on firm footing when it studies the ways in which Apple helped legitimize a business model that the music industry viewed with a mix of suspicion and hostility. But the company’s genius is in refinement, not invention. Apple CEO Steve Jobs is a charismatic figure, and the best salesman of his “insanely great” vision. Unfortunately, Levy seems willing to give him credit for things he had nothing to do with. That’s a shame, because what Steve Jobs is good at – inspiring engineers and designers to perform fits of brilliance – is almost buried in hagiography. Jobs’ famous “reality distortion field” has drawn in many a journalist. In this case, much of “The Perfect Thing” becomes a story of Jobs and not the candy bar-sized device he unleashed upon the world. With the iPod, Apple created a product that was easy to use, powered by technology that was always two or three steps ahead of the competition. They addressed the vexing problem of getting music from the computer to device by creating a trinity of computer, software and device. Apple wrote the ITunes software to recognize and add music to the iPod automatically. When the iTunes Music Store was introduced in 2002, it was built into the software. Like the elegantly simple Macintosh computer, this integration and ease of use is the key the iPod’s charm. The iPod’s cultural impact is undeniable. “The Perfect Thing” provides a lively account of the myriad ways it has affected the landscape of music, television and, with the advent of podcasting, journalism. The first chapter of each edition, “Perfect,” paints Steve Jobs as a Pied Piper of the Apocalypse, trying to “bring a little joy in to people’s lives” during the product launch shortly after 9/11. “Origins” recognizes the true pioneers in the field, from the Sony Walkman to, in the late 1990s, Compaq’s “Personal Jukebox.” The latter most directly influenced the iPod. “Personal” looks at the iPod’s tendency to isolate listeners into a self-contained musical world, and the sociological implications of “[making] everyone into an extra from Village of the Damned.” The chapter also explores the evolution of personal audio cocooning, from transistor radios to Andreas Pavel’s “Stereobelt,” a shoebox-sized behemoth designed with two headphones for shared listening – a feature initially included in the Sony Walkman. “Download” describes the way Jobs used his personal charms to persuade everyone from Sheryl Crow to Yoko Ono that the iTunes Music Store was the last best hope for digital music. “Cool” is Levy at his gushiest, implying that only Apple had the foresight to dream up this wonderful device and an Internet store to feed it, even as the vast majority of music is today stolen online. This is a situation with no clear solution, but Levy fails to point out business models like Rhapsody, which might provide better legal download solutions. The phenomenon of “Podcast” provides the book’s best moments. Sometimes whimsical broadcasts, distributed as MP3 files, have caused what Jobs rightfully would refer to as a “tectonic shift” in both radio and television. Apple legitimized the technology less than a year after it was introduced by incorporating it into the iTunes Music Store, and when it began offering commercial-free network television shows a few months later, turned episodes of “Desperate Housewives” into podcasts. “The Perfect Thing” offers a mix of myth and history with unbound enthusiasm, in a well-written paean to a little Lucite box that’s arguably the most important technology of the 21st Century. At least that’s how Steve Jobs would describe it.